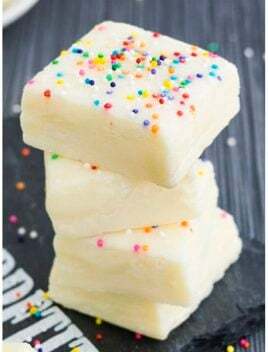 This easy, no bake, 2 ingredient white chocolate fudge recipe requires condensed milk and white chocolate. It’s rich, fudgy, creamy and great for Holidays. I tried so many white chocolate fudge recipes over the last two weeks, while searching for the PERFECT one. Some of them tasted awful and others had an unusual texture and honestly, one recipe smelled so funky that I just threw out that batch! Eeks! Finally, I made this INCREDIBLE white chocolate fudge with sweetened condensed milk. It’s rich, fudgy, creamy and so pretty and white. 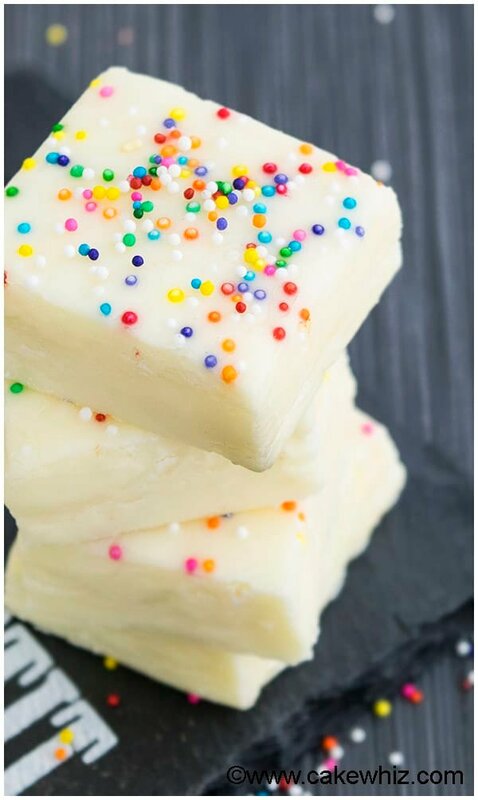 If you have a sweet tooth, this NO BAKE white chocolate fudge will satisfy all your cravings. It took me a little while to get the ratio of ingredients just right but it’s now a dummy-proof, NO FAIL recipe that even beginners can make! What is white chocolate fudge made out of? How do you make white chocolate fudge from scratch? Everyone seems to have favorite recipe. My easy white chocolate fudge recipe is made with TWO simple ingredients: condensed milk and white chocolate. This fudge is made WITHOUT marshmallows, marshmallow cream, evaporated milk, cream cheese or sour cream. The process to make this fudge is very simple. Melt white chocolate. Then, and add condensed milk and mix everything until smooth. Finally, pour the mixture in a dish and refrigerate until the fudge sets. Make sure to use high quality white chocolate. Your fudge is only as good as the ingredients you use. I like to use Ghiradelli. You can melt the chocolate in the microwave or double boiler. Watch your chocolate like a hawk and do not over-heat and burn the chocolate. If you are melting in the microwave, stop every 30 seconds and mix everything with a spatula and then reheat again. Do this until the chocolate has fully melted. Do not replace or substitute condensed milk with evaporated milk, whole milk, half and half or creamers. This recipe will not work with those ingredients. Heat condensed milk so that it’s warm but not boiling hot. This helps the chocolate and condensed milk to blend together smoothly and evenly. You can easily double or triple this recipe. I use a ratio of 4:1 ratio for chocolate and condensed milk: 4 cups chocolate and 1 cup of condensed milk. You can also color this fudge with oil-based candy coloring. 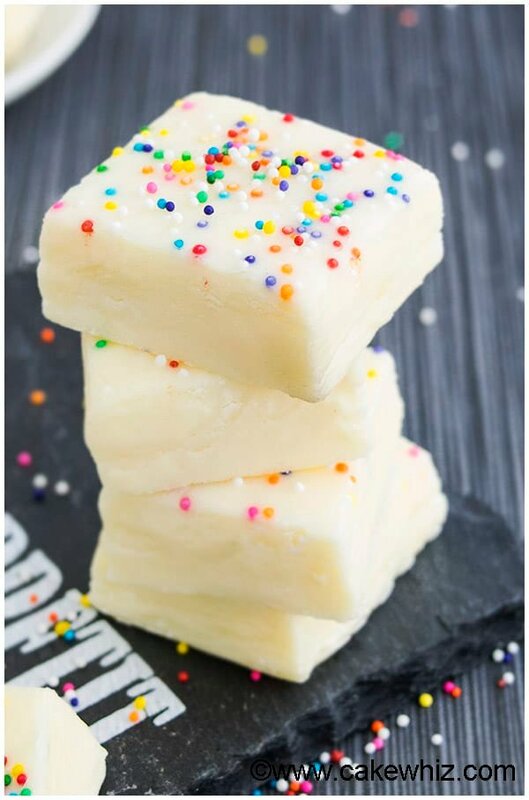 I made white chocolate fudge with sprinkles, just to give it a pop of color. However, feel free to get creative and use whatever toppings you like and make white chocolate fudge with walnuts, cranberries, pistachios, cherries and even caramel or peppermint. You must chill the fudge for at least 3 hours or until it becomes firm and easy to slice. I like to chill overnight. Store leftovers in an airtight container the fridge for up to 1 week. If you thin out this fudge with more condensed milk, you will end up with white chocolate fudge sauce for dripping on cakes, cupcakes, pancakes and even waffles. You can also use it as a filling in cakes and cupcakes. My family loves to make homemade candies like barks, truffles and fudge during the Christmas holiday season. We wrap them up in nice boxes and give them to all of our family and friends and even mail them out to people who are not local. My little one has started enjoying this TRADITION and loves to get involved. He helped me make white chocolate CEREAL fudge this week. I know it’s CRAZY but we love cereal and we love fudge. So, I thought it would be FUN to combine them together. 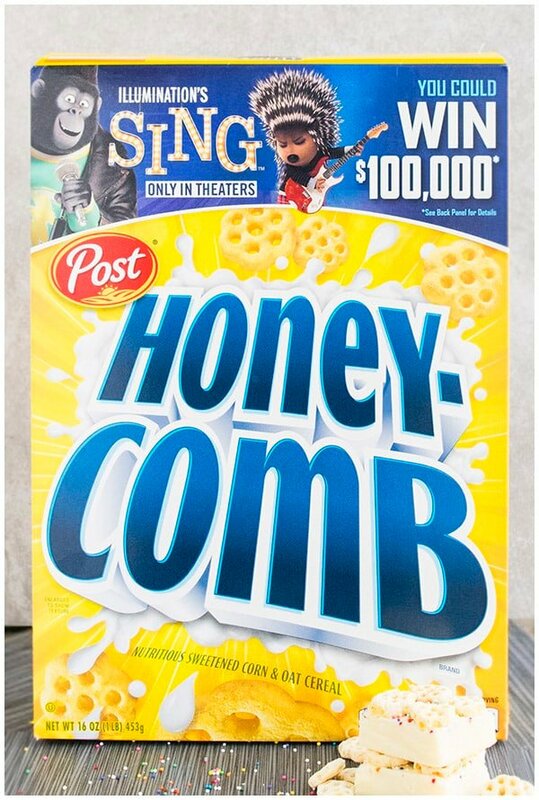 This Honeycomb® cereal version pretty darn GOOD. I like the wonderful CRUNCH in each bite plus they have such a pretty shape. My cutie got so EXCITED when he saw the cereal box since it had pictures of the SING© movie characters and he has been begging to go to that movie since Summer. I keep telling him it will release on December 21 and it will be our family Christmas movie this year. But now, I am constantly answering these SILLY question: “Is it December yet? Is it Christmas yet? How many more days?” hahahah. 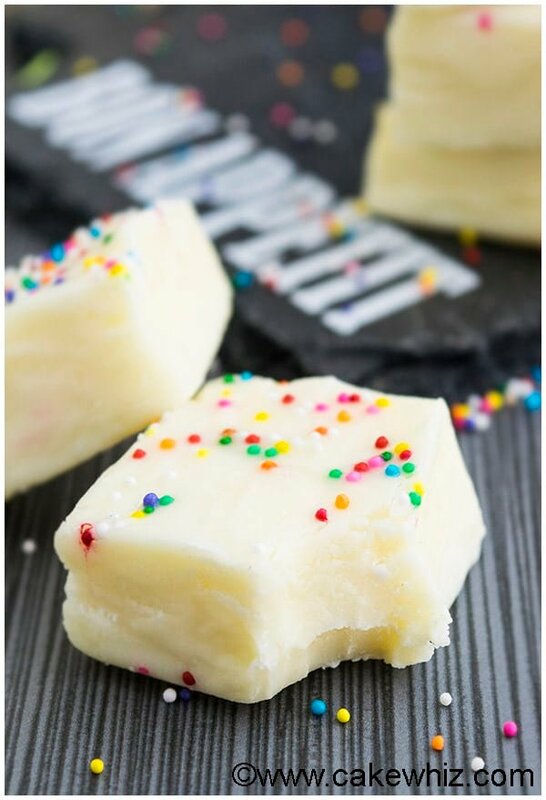 This easy, no bake, 2 ingredient white chocolate fudge recipe requires condensed milk and white chocolate. It's rich, fudgy, creamy and great for Holidays. In a deep bowl, add white chocolate and heat in the microwave until it melts. Make sure to mix with a spatula every 30 seconds to prevent the chocolate from burning. Add condensed milk and mix until smooth. Pour this mixture in a Pyrex dish (Dimensions: 10x7x2 ), lined with wax paper. Toss some sprinkles on top of the fudge. Chill in the fridge for at 3 hours or until the fudge it's firm enough to slice. Enjoy! 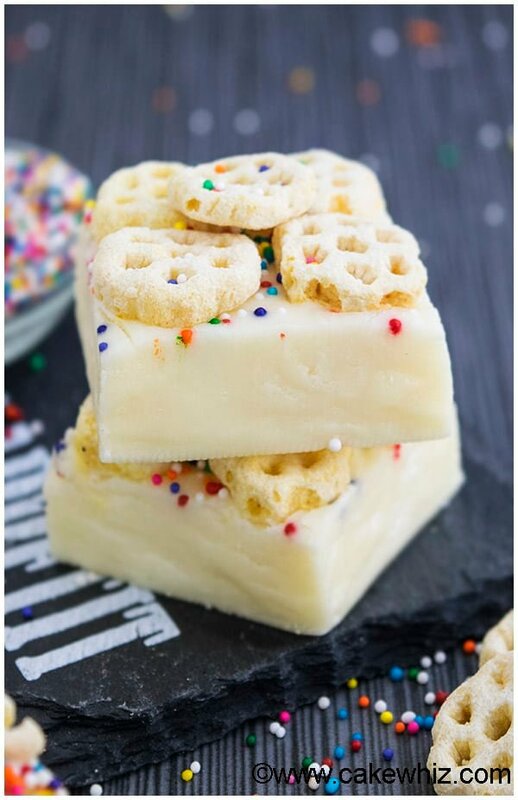 To make Honeycomb cereal fudge, follow steps 1-3 and then stick cereal pieces on top of the fudge, toss some sprinkles and chill until fudge is firm enough to slice. Made this, chilled it and now I can’t cut it or even get it out of the pan. Let it sit out for 15-20 minutes at room temperature so it starts to soften a little and then slice. Also, did you line your dish with wax paper? You are supposed to. It’s super easy to remove. You will have to use oil-based food coloring that’s suitable for chocolates. You can find it on Amazon or Michaels or Hobby Lobby. I have used the Wilton brand before successfully. Don’t use regular water-based food coloring because that will cause your chocolate to seize up and become clumpy.